Type of trail: Out and back, composition: sand, decomposed granite, soft soil. That and about 18″ of snow. 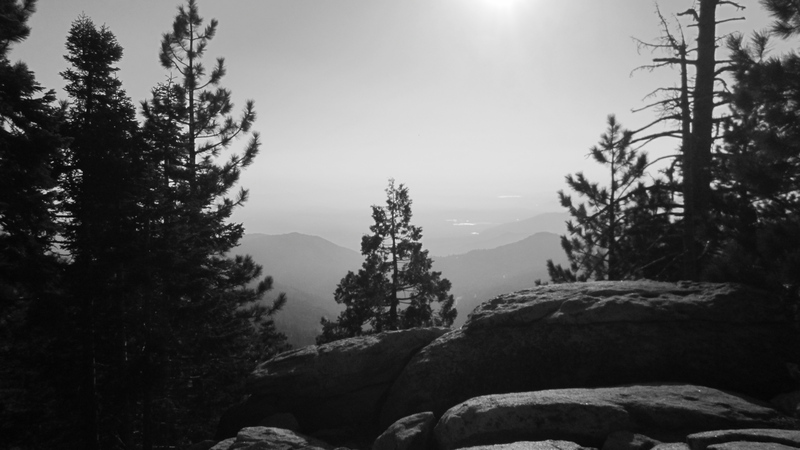 Approximate elevation: Trailhead-4,900ft., Top of trail-7,000ft. As a kid living in the northeast, I loved it when it snowed. Enough of the white stuff meant a day off to play. After you grow up and you have to shovel or scrape the ice off the car, it isn’t so fun anymore. 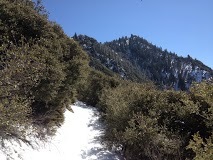 Today, we would seek out a snowy trail south of the San Jacinto Wilderness. 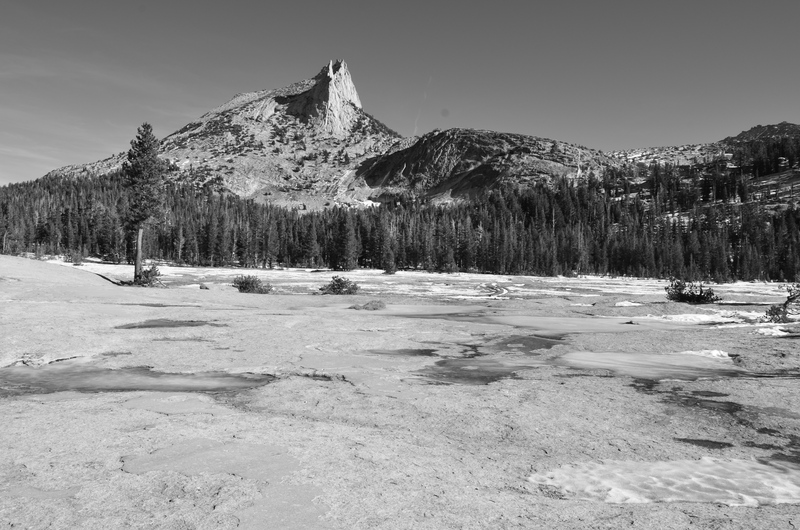 I’ve been in this area a couple of other times and enjoyed the solitude and varied terrain. We brought some friends with us today and I promised them a challenging hike with views of sub-alpine valleys and vast, arid Borrego Desert. 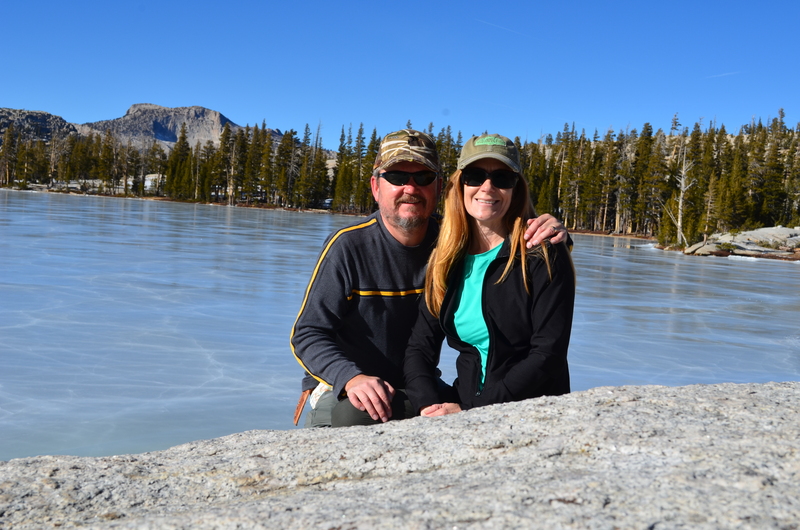 Within the past week, we’ve had our seasonal rains in San Diego County, so we hoped for a bit of snow above 5,000 ft. Just last weekend, we were on the beach roughing it in the RV. The typical winter day near Oceanside was mid 60’s, great for walks on the shore watching the snowy plovers nesting. Anyhow, there aren’t many places in this great country where you can go to the beach in shorts one day and hike in a foot of snow the next. Our friends asked if they should bring their gaiters and I’m glad I said yes. 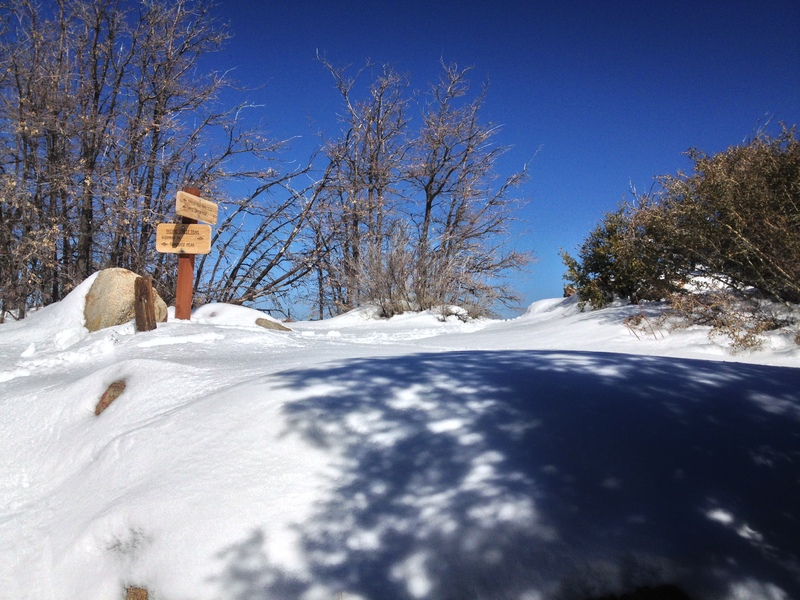 The trailhead had about 6 inches of powdery snow which meant the higher elevations would definitely have more. It was strange to see snow amongst the chaparral, cactus and agave. The wind was gusting around 10-15 mph and the temps were around 45-50. 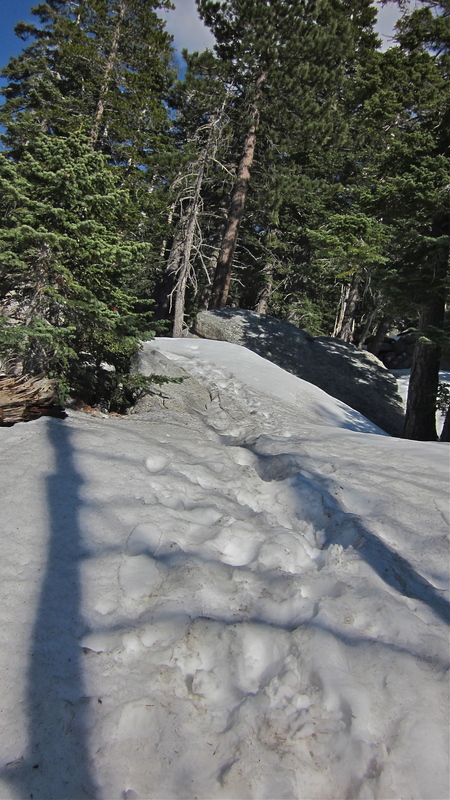 After a couple of miles of intermittent snow and dirt, the trail gradually changed to all snow. Eventually, the only tracks were our own and the occasional cloven hooves of a deer. As the trail wound its way toward Spitler Peak, the northern exposure provided us with increasing snow depths approaching 18 inches. We probably could have used snow shoes at this point, but the powdery texture made it easy to follow the footprints of the first hiker. 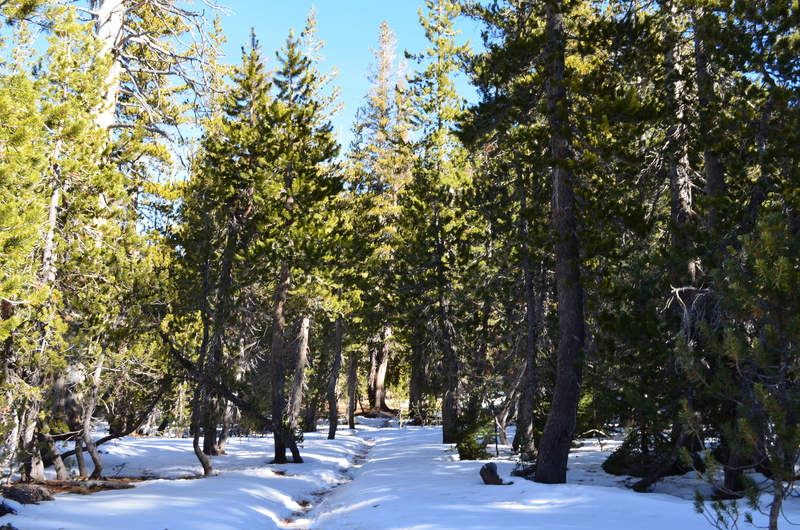 The chaparral gradually changed into mostly deciduous trees covered in a blanket of snow, which was falling on us. The trees would continue their attack on us as the occasional gust would loosen clumps As we neared the summit, the steepest part of the trail was also the deepest and the surroundings became more like an alpine wonderland. We looked forward to the intersection of the Pacific Crest Trail where we would have lunch and some hot tea. The 2,000 ft. of elevation gain was a challenge on any day. Today, coupled with the snow it was slow going as the snow began to cling to our boots and gaiters. Each step was a bit heavier, yep snowshoes would be good right about now. We rounded the last switchback and the blue sky opened up as the trail marker for the PCT poked out through the rocks. The desert vista to the east was beautiful as always. Our shelter of trees gone, the wind chill made it feel like it was 30 degrees. Lighting the small MSR Pocket Rocket stove proved to be difficult today. The combination of wind, high altitude and low temps make these little stoves with the butane-propane a mediocre choice in these conditions. Lesson learned-keep a small canister of fuel in my jacket to help the fuel condense. The wind chill began to affect my dexterity too. After 5 minutes or so, I finally got it lit, boiled our water and enjoyed a nice hot cup of Earl Grey. It’s the little things….. The trip down was much faster and a bit slippery. The steady dose of sun created a frequent snow shower as we passed under the trees. Mary put on some micro spikes and they really made a difference on the icy patches. As we descended through 5,500 ft, the trail became a mix of mud and slush. 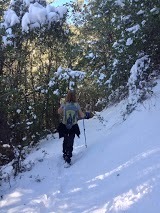 I gave up my trekking poles so that my friends could have that extra “leg” on the way down. I’ve developed some trail legs over the last few years and rarely stumble. Besides, I’m short and don’t have far to fall. The last couple of miles became a bit tedious as sloshed our way to the trailhead. Fifteen minutes later, the Paradise Cafe near the town of Anza awaited us with the promise of amazing baby-back ribs, flatiron steak and delicious burgers. Yes, the best way to end an awesome hike is with a fantastic meal. Mary and I have discovered our favorite area to hike in Southern California. 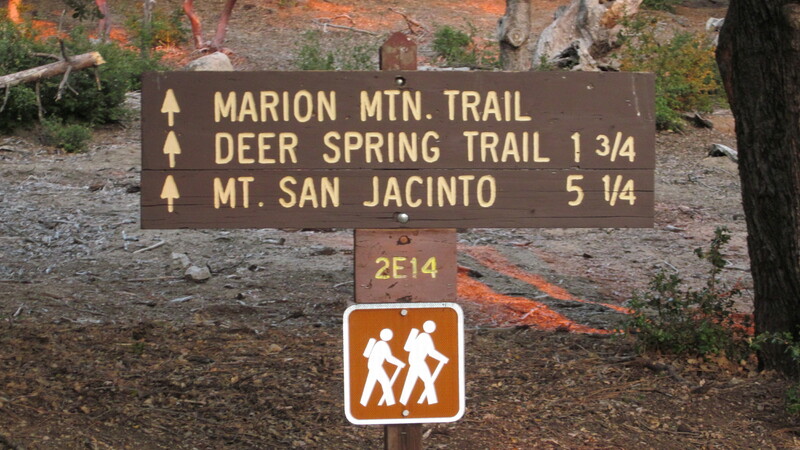 The San Jacinto Mountains are less than a two-hour drive from North County San Diego. 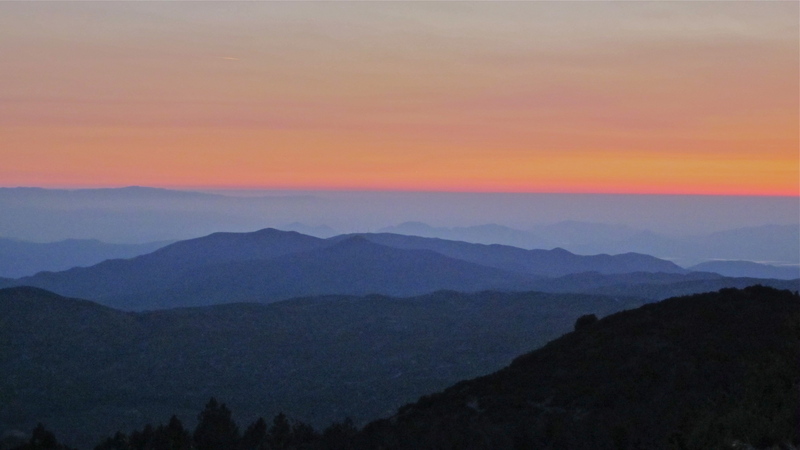 This range is on the northern end of the Peninsular Range that extends into San Diego County, all the way to the Baja California Peninsula in Mexico. Off on our usual late start, it was a comfortable 68 degrees leaving home. By the time, we passed Temecula, 88 and the town of Banning on I-10 was a dry 97 degrees. A general rule of thumb is that for every thousand feet you go up, the temperature drops 3-5 degrees. We wanted to get above 8,000 ft. today so that would hopefully be in 70 deg temps at the summit. Driving up the 15, San Jacinto Peak stands out early, with its snow-capped peak in stark contrast to the flat, dry valleys surrounding it. Our approach through Banning brought us up the northwest side and the curvy switchbacks on the 243 make for an enjoyable ride. Since we would be hiking in the wilderness areas, we needed to obtain the wilderness permit at the state park headquarters in Idyllwild. Not knowing exactly which trail we would hike, I wrote down Marion Mtn. and Seven Pines for the permit. I usually print out a partial topo map of the areas we hike since we trail-blaze occasionally. I picked up a Tom Harrison trail map of the San Jacinto Wilderness at the ranger station and asked for directions to the trailhead. The Harrison maps work well for me since they are fairly durable and have UTM coordinates on the outside edges. My little Garmin Foretrex GPS works ok using UTM. The Marion Mtn. 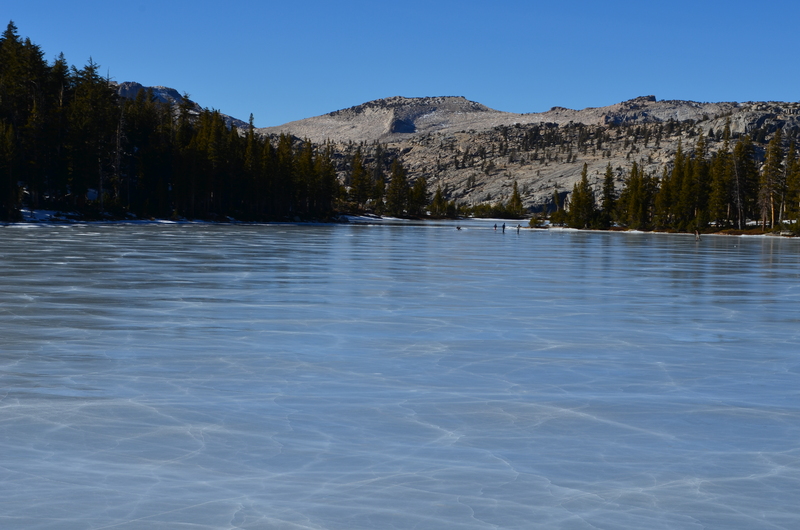 trailhead is located near several campgrounds, none which are opened for the season. The trail wasted no time increasing in elevation, the first mile was almost a 1,000 ft. gain without an abundance of switchbacks. The path was well maintained and we crossed a couple of fire or maintenance roads before entering into a deeply wooded area. The amount of dead timber was really high. I haven’t researched it, but it was almost like these trees were hit by disease or a wind storm since the wood was not burnt. Even so, there were plenty of thriving Sugar and Jeffrey Pines, along with some fir trees. A mile or so into it, the trail became harder to distinguish and by the time we hit the second vernal stream around the 1.2 mile mark, we climbed onto a bolder in the middle of the stream and had our lunch. Also brought my Kindle on this day and we did our daily couple’s devotion right there on the rock. The one we use is named Moments With You by Dennis and Barbara Rainey. It was an awesome time surrounded by God’s creation. Once again, not a soul around but us. Marion Mt. Trail looking north. We jumped down and crossed the stream to what appeared to be the trail. Not long after, we realized that we were bushwhacking again. After 30 minutes of picking our way up the mountain, I broke out the map and got a rough plot of our location. Land navigation is a skill that is challenging to be proficient at and difficult to master. The terrain was covered with tall pines and huge boulders, making it tough to pick out landmarks more than a few hundred yards away. Our estimated position was about 400 yards east of the Marion Mtn Trail and maybe 1000 yards to a major trail junction. We worked our way around the scrub, over a few streams and found the actual trail. From this point on, the path was a mix of blowdowns (fallen trees) snowed over, and streams that flowed down the trail. The snow was crusty and slippery due to the cycle of melting and freezing over the past couple of weeks. The snow was hard to hike in but a blessing because you could make out the footprints of those that had gone before. Surrounded by the white stuff, it was noticeably cooler, almost like when you open the refrigerator. 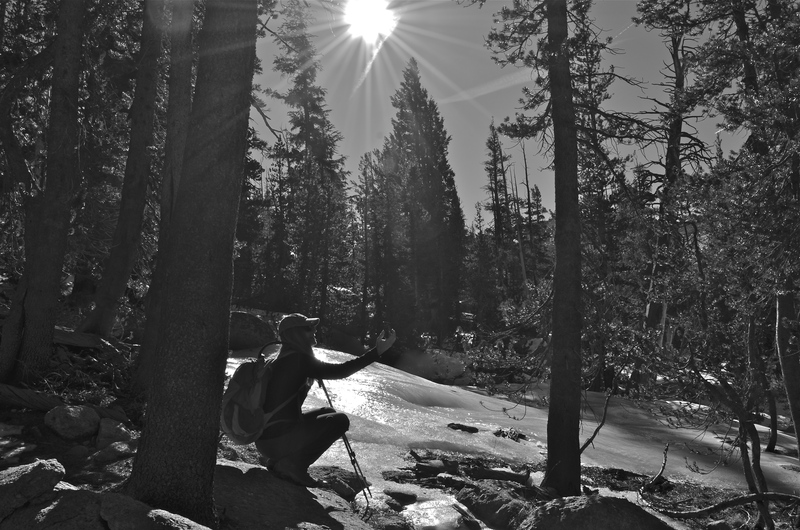 We continued to trudge uphill and it leveled out around 8700 ft. We hit the trail junction which was the intersection of the Marion Mt., Seven Pines Deer Springs and the PCT. San Jacinto Peak was also “only” a couple of miles away. Tempting, but it was already after 5 p.m. and we weren’t exactly prepared to camp out in the snow. While each of us carries a small survival kit in our day packs, I could tell that Mary did not want to create an episode of survivor man/woman. We decided to lay in the snow and pretend to make snow angels. The descent was a bit more treacherous and slippery because the snow hid the rocks underneath; a sprained ankle up here would make for a long trip down. Picking my way around a fallen tree, I was following tracks in the snow and before I knew it I post-holed ( fell in a drift up to my thigh). Funny thing was that it was just the right leg, so I awkwardly extracted myself from the hole and laughed at myself. We were able to follow the trail the remainder of the trip and weren’t sure where we actually got off the trail going up. We ran into another couple on the way down who said that they also lost the trail and turned around. So, the path less traveled is worth it as long as you are prepared. The Marion Mt Trail is a great trail that is moderate-strenuous with decent views. 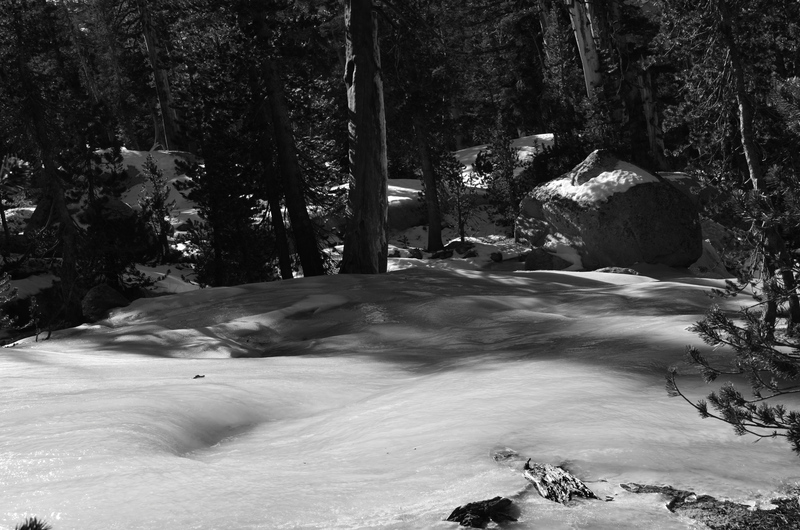 In early spring, there is plenty of snow and streams to explore. Headlamp: Ultra Bright LED Headlamp Flashlight – Complete Lifetime Guarantee! Light & Comfortable With 248% Longer Battery Life! Adjustable White, Red, And Strobe Light Ideal For Camping, Running, Hunting, Reading, More! Water Resistant with 3 AAAs Included! Lessons Learned: 1. Take maps and practice land navigation with a compass. 2. A GPS is nice, but technology isn’t always reliable. 3. 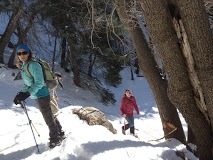 Hiking in the snow is tricky, especially going down a slope.